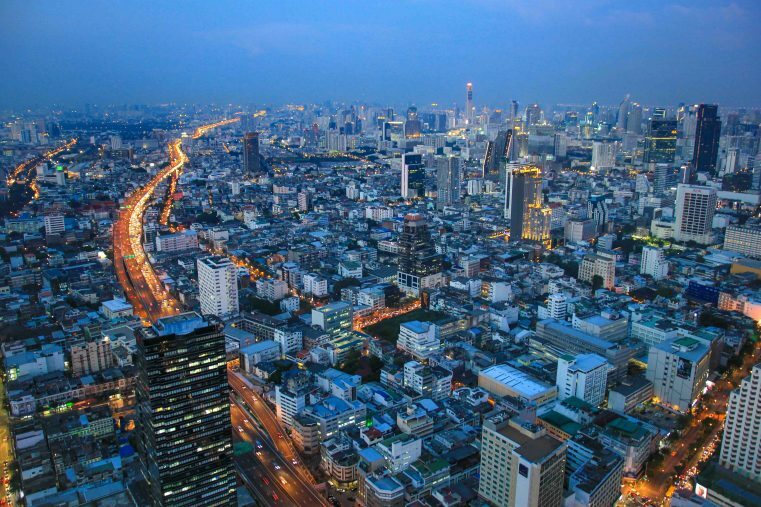 What would Bangkok be without its stunning skyline and the numerous spectacular rooftop bars? 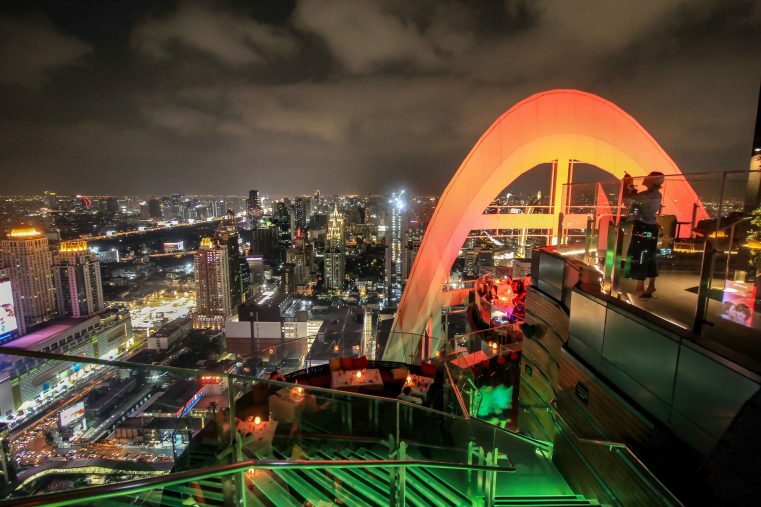 Most of these dizzying sky bars are on top of Bangkok’s best hotels. Whether daytime or at night, enjoying a delicious cocktail on one of the famous sky bars is almost a must do when you are exploring the “City of Angels”. 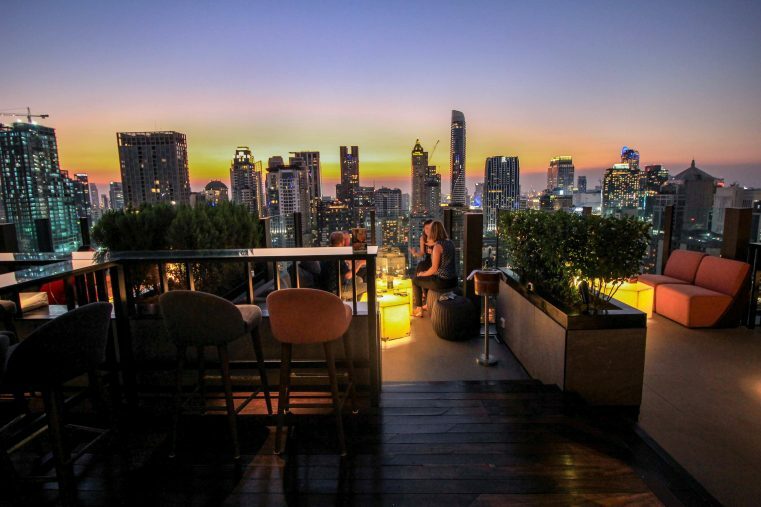 But which sky bar has the best view, which are the coolest places at the moment and what are really the best rooftop bars in Bangkok? 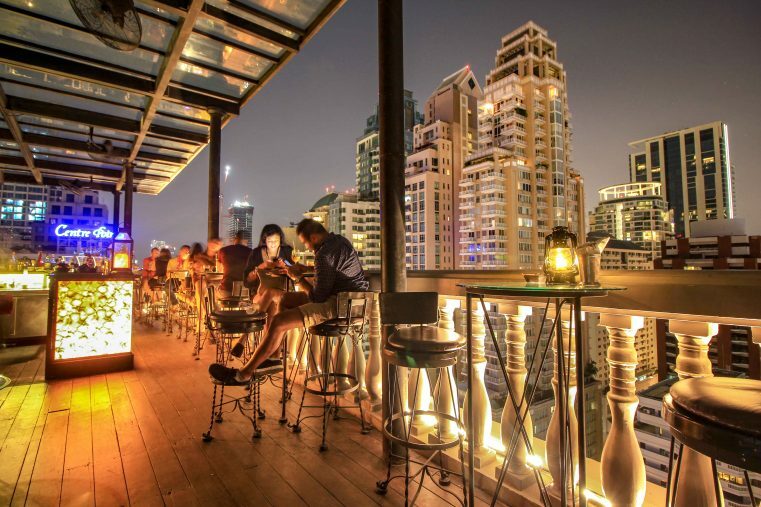 The Char Rooftop Bar at Indigo Hotel is one of our absolute favorite rooftop bars in Bangkok. 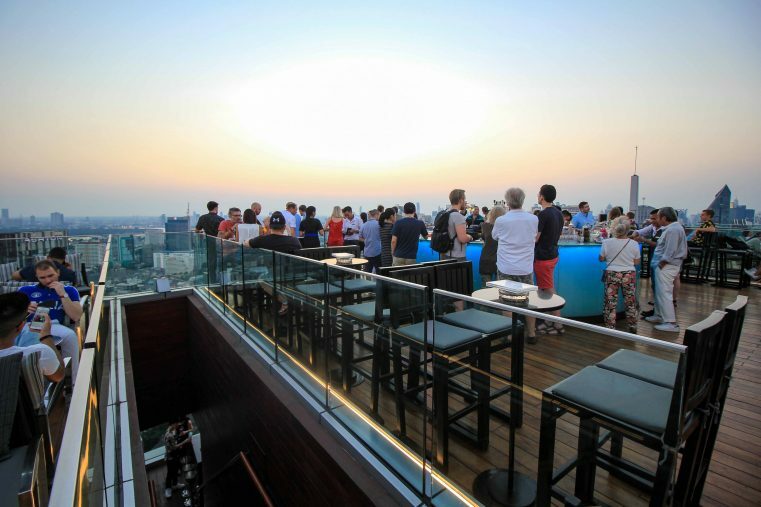 This sky bar is one of the best in town and we highly recommend a visit to everyone who wants to see Bangkok from above. The bar itself is very nice and really cozy, the cocktails are fancy and delicious, and the view is just amazing! Dress code for the Charr Rooftop Bar is smart casual. The Indigo Hotel is a 4-star hotel with a really cool infinity pool. This hotel is not just really stylish but also it is a great place to stay in Bangkok. Opening Hours: The Char Rooftop Bar is open from 6:00 pm to 12:00 am. The rooftop bar at the Muse Hotel is a real insider tip in Bangkok. Not overly high (25th floor), you are surrounded by the gigantic skyscrapers. But not only the view, also the cocktails are amazing, the staff is top and the whole atmosphere is really cool. Although the ambiance here is really luxurious, a compulsive dress code is waived. Compared to other sky bars in Bangkok, the drinks are really cheap. The Muse Hotel is an absolute hotel tip for Bangkok, perfect for a special getaway in the City of Angels! Tip: Gin fans will love the huge selection of gin-tonic. Opening Hours: The Speakeasy Rooftop Bar is open daily from 5:30 pm to 1:00 am. Currently, the King Power Mahanakhon Tower is the tallest building in Bangkok with a height of 314 meters and 77 floors and a visit is a highlight of any trip to Thailand. Also, we loved our trip up this dizzying height. The tour of the tower costs about 20 euros per person, but includes drinks vouchers. 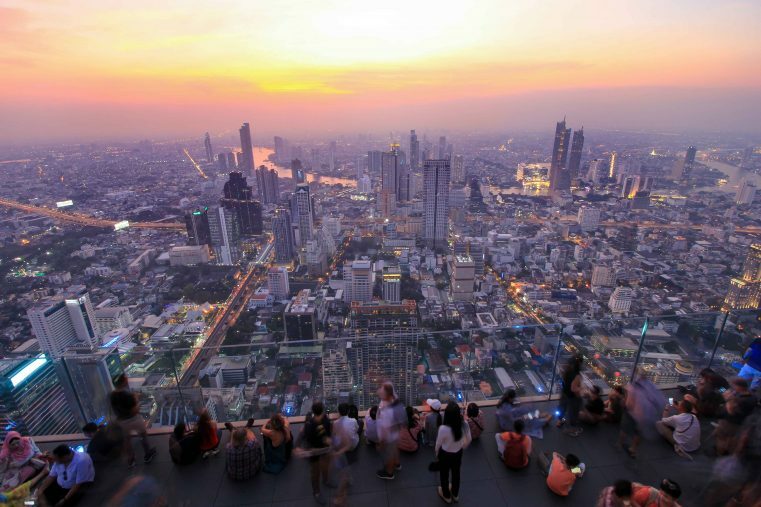 If you want to have a drink at the highest rooftop bar in Bangkok and enjoy the best view of the city, you should definitely visit the King Power Mahanakhon Tower! No dress code here. Tip: Anyone who dares can walk over the skywalk, a glass floor over 300 meters. Opening Hours: Kingbar Mahanakhon’s Skybar is also open during daytime. Visiting hours are 10:00 am to 24:00 am. 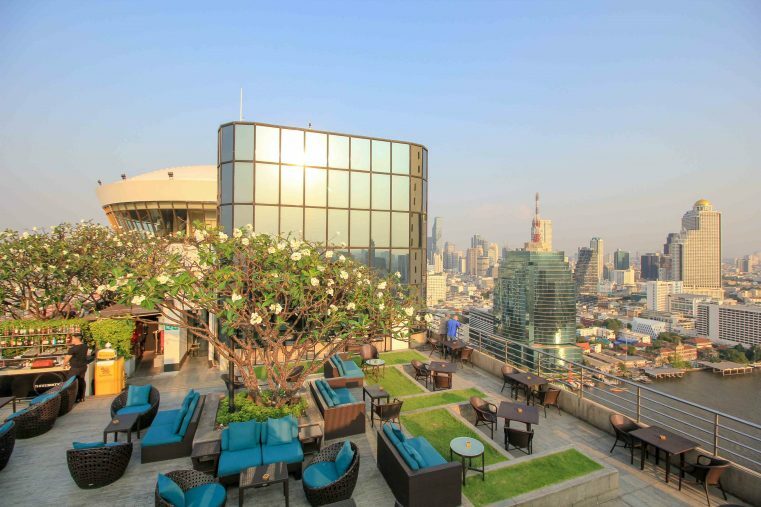 Another famous rooftop bar in Bangkok is the Octave Sky Bar at Marriott Hotel. From the top you have a breath-taking 360 panoramic view of the city. The bar is the place to be, where the nightlife scene meets at sunset. No specific dress code is needed, and it is much cheaper compared to other rooftop bars in the city. For that sky bar, we recommend making a reservation. Usually, just before sunset the bar is usually completely full. If you want to stay in this wonderful hotel, you can check the prices here. Hours: The Octave Rooftop Bar opens from 5:00 pm to 2:00 am. The Lebua State Tower, with its mighty golden dome, is one of Bangkok’s most impressive skyscrapers and is home of the city’s most famous sky bar. Once, the hotel was a movie location for the film Hangover, that´s why people love to visit this special bar. The view from the 64th and 65th floor to the city of Bangkok is definitely more than breath-taking. Lebua State Tower is one of the highest in the city. Unfortunately, the prices have also become unbeatable, both sky bar and Sirocco restaurant are quite expensive. Click here for more about the Lebua State Tower 5-star hotel. Tip: You will first be led into a “sidebar”. You should expressly say that you only want to drink something at Lebua Sky Bar! The Lebua dress code is smart casual. Opening hours: The Lebua Sky bar is open from 4:00 pm to 1:00 am. The Sky bar at Banyan Tree Hotel is one of the best rooftop bars in Bangkok. The view from the 61st floor is gigantic and the marvellous ambience make it to one of the city’s most spectacular bars. Since this Sky bar is very well known, you should come early to get a good place for watching the sunset. Especially if you travel to Bangkok for the first time, a visit to this Sky bar is highly recommended. The Banyan Tree is a top-notch hotel and whoever can afford it should take a look here. Banyan Tree dress code is for both, Vertigo and Moon Bar smart casual. Opening Hours: The Vertigo & Moonbar opens daily from 5:00 pm to 1:00 am. The Millenium Hilton 360 Rooftop Bar is located on the western side of the river and offers its guests a magnificent view of the giant Chao Praya River. The atmosphere on the roof terrace of this cool sky bar is really relaxed. Never crowded and without a dress code – perfect for a pleasurable sundowner. In the interior, soft jazz and life music plays every night and guests are spoiled with delicious drinks. The 360 Rooftop bar is located on the river side and both daytime and by night, this Sky bar is worth a visit! Here is more information about the Millennium Hilton. Opening Hours: The Rooftop Bar opens from 5:00 pm to 1:00 am. 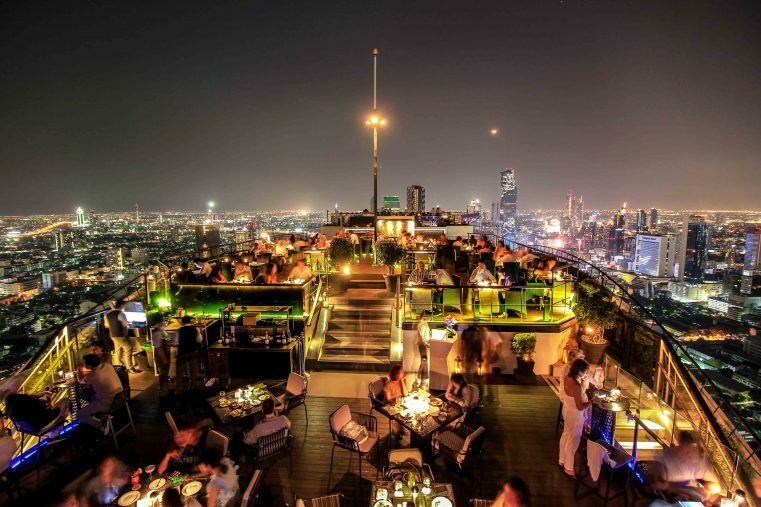 The Red Sky Rooftop Bar at the Centara Hotel is located on the 55th floor and also offers fantastic views over Bangkok. Here, the dress code is very strict, especially for the restaurant you have to be very well dressed. That means perfect evening wear (suit, evening dress) is mandatory here. With its eye-catching design and spectacular views from above, the Red Sky Bar Centara is one of Bangkok’s best sky bars. Prices are accordingly higher than average. The Centara Grand Hotel is located in the complex of the Central World Shopping Center. Opening Hours: This Skybar opens from 11:30 am to 1:00 am. The Zoom Sky Bar at Anantara is definitely worth a visit. Here you will not only enjoy a great view from the 40th floor, but also a surprisingly good and inexpensive food and beverage offer. Also, the service leaves nothing to be desired. A strict dress code is less valued here. So, you can marvel wonderful sunsets and the glittering skyline of Bangkok without being overdressed. The prices (10 Euros per cocktail and 6 Euros for beer) are still acceptable. 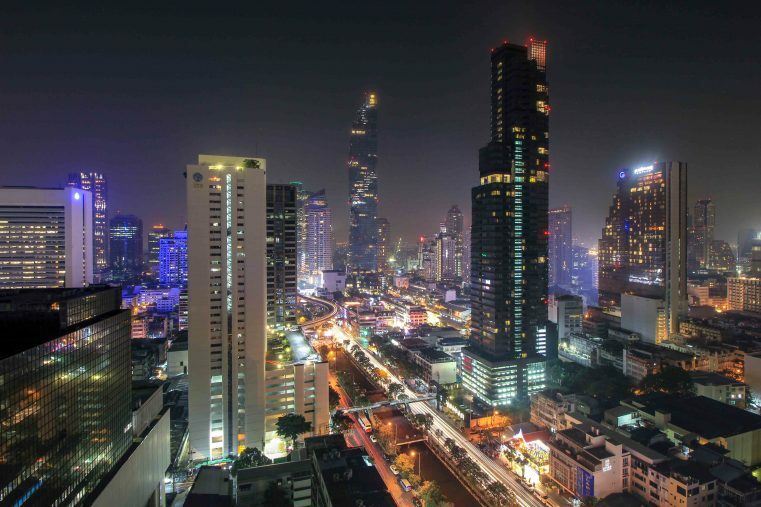 Tip: The Anantara Sathorn Hotel is one of the cheapest 5-star hotels with sky bar in Bangkok. 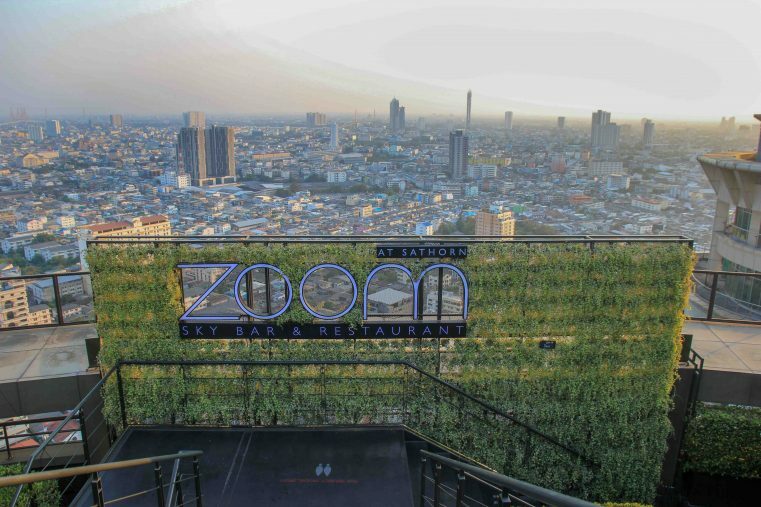 Opening Hours: The Zoom Sky Bar opens daily from 5:30 pm to 1:00 am. 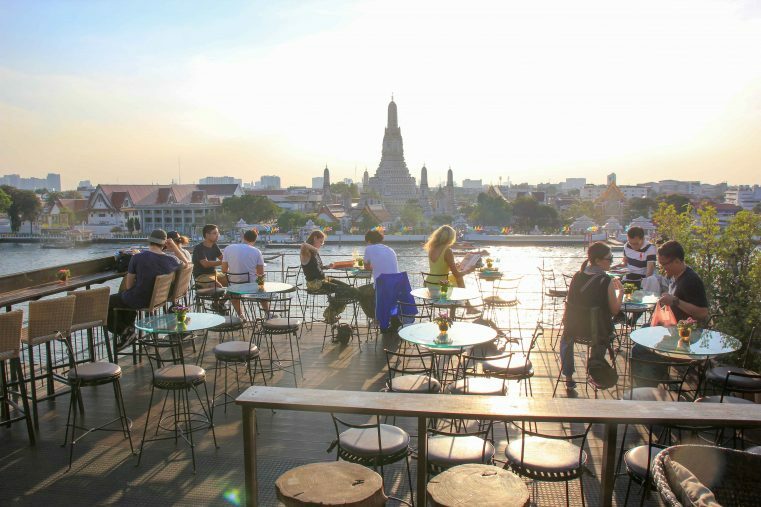 The Eagle Nest is one of Bangkok’s most beautiful rooftop bars at the river side and the spot to be if you want to admire Wat Arun at sunset. The view from this roof terrace is unbeatable! Because of these, the Eagle Nest is one of the insider tips for Bangkok among photographers. And really, from this rooftop bar you can shoot brilliant pictures. From Khao San Road it is only 3 kilometers to this Rooftop Bar. Tip: To get a nice table, make sure you come to the Sala Arun Hotel about 20 minutes before opening. Opening Hours: The Eagle Nest opens from 5:00 pm to 12:00 am. The Amara Sky bar is one of the cheapest sky bars in Bangkok. Without annoying dress code, but with reasonable prices at the happy hour from 19:00 to 21:00 and with a dream view over the city, the AKAAZA BAR delights its guests enormously. Admission is free, only the great Infinity pool is reserved for hotel guests of the Amara Hotel. Tip: If you want to stay in a good hotel with really cool infinity-pool and sky bar, then you should book your room at Amara Hotel. Opening Hours: From 8:00 am to 1:00 am. Dress code: Many rooftop bars in Bangkok insist on a special dress code. Men should wear long pants and closed shoes. Women are generally considered to be dressed casual too. Beach clothes like flip flops, shorts and tank tops are usually a no go. Reservations: You do not need a reservation for the Sky bars in Bangkok. To visit the restaurants of the bars, it is still advisable to reserve a good table.